I've just returned from three weeks in Europe and besides it seeming like I was away for a lot longer, it also feels like I haven't blogged in ages. Of course, that wouldn't seem to be the case since, thanks to the wonders of forward scheduling, the posts I wrote before I left published themselves in my absence and we haven't missed a week of the ARIA charts from 1988. The new entries from this week in 1988 were a particularly good batch of pop songs - and I actually liked all of them to one extent or another at the time. Although, one hasn't aged very well at all. At the top of the chart, Cheap Trick were still at number 1 with "The Flame", but Louis Armstrong's "What A Wonderful World" was closing in fast. She'd landed four top 5 hits between 1983 and 1985, but Laura Branigan's ARIA top 100 career came to an end with this latest flop from Touch. A fairly boring song, it was later recorded by Stevie Nicks for her The Other Side Of The Mirror album. Before we get to the pop, a slice of British indie music for you - and one that, despite prominent advertising this week 25 years ago, failed to make the Australian top 100 at all. 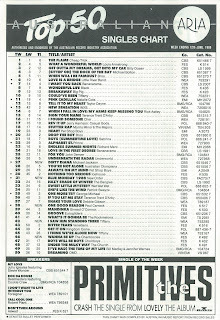 Over in the UK, "Crash" was the biggest hit for The Primitives (it reached number 5), a band I always associate with similar sounding local groups like The Clouds and The Hummingbirds. If "Crash" was released now, I'd probably quite like it, not least of all because it sounds like the opening music for a '90s teen sitcom, but in the '80s, I was unmoved. After the disaster that was "He's Gonna Step On You Again", pop's most attractive group decided to tackle an original song for a change - and "Wanna Be Up", which was written by Eve von Bibra and Brett Goldsmith, would become the song for which they're probably best known. Even though it didn't reach as high a position as number 4 hit "Witch Queen", it wound up as the year's 22nd biggest single. Here's another act with an over-reliance on cover versions. Tiffany shot to fame with her remake of "I Think We're Alone Now" and, for her fourth single, tried her hand at The Beatles. Not only that, but the lyrics were changed so "I Saw Her Standing There" became gender appropriate for the teen star. Although it's pretty unlistenable now, the perky pop track became another top 10 hit for Tiffany in Australia. Little did anyone know at the time, but it would be her final appearance in the top 50. Debuting at its highest position (which it would hold for two straight weeks) was this latest single from the former Ace and Squeeze vocalist. Like "Don't Shed A Tear" before it, it was a much better song than this chart position suggests, with a great chorus. Paul would be back in the higher reaches of the chart in 1989, when he rejoined Mike + The Mechanics for their most successful single, "The Living Years". It had done pretty well in Australia first time round, reaching number 13 in 1983, but the 1988 update of "Blue Monday" went even further. While the original version clocked in at seven and a half minutes, the new mix (by Quincy Jones, no less) had a much more traditional length of just over four minutes and was much poppier in style. "Blue Monday 88" even had a proper music video, in which the band members not only were seen but even cracked smiles. Like Paul Carrack's single, the fifth release from Bad also debuted at its highest chart position - and held that spot for two weeks. Much was made at the time of the song's lyrics and whether they were about Jacko's gal pal Diana Ross or even Princess Diana. The truth was much less sensational - with the song dealing with the topic of groupies. Like "Beat It" before it and "Give In To Me" after it, "Dirty Diana" featured a solo from one of the leading guitarists of the day - in this case, Steve Stevens, who was best known for playing with Billy Idol. Next week, we look at the last ARIA chart before it went through a major transformation. Before that, I'll pick up my own top 100s with a trip to 1994. It's odd that 'Cry Wolf' charted here and seemingly nowhere else. 'Wanna Be Up' must be one of, if not the, most-played background songs on Home and Away during the early years. There was a whole verse devoted to a scene where Matt was driving, and it even featured in Ailsa's seeing-Bobby's-ghost-come-out-of-the-fridge scene when she switched on a cassette tape (not the radio) to help distract herself from Bobby's imminent re-emergence from the dead (!). The song had an interesting song structure for a 3 and a half minute pop song, taking nearly 2 minutes to get to the chorus. I didn't like that 'I Saw Him Standing There' had another live video; and this time, even worse, with actual live audio (I think). That's now how you market a teen act. I haven't heard 'One Good Reason' in quite some time, but it's good. I may be imagining things, but I thought it had a different video. Maybe there were 2 versions, like 'When You Walk In the Room'. Nothing (possibly any song) beats the original 1983 version of 'Blue Monday' for me, but the '88 remix was pretty good. At least we got a proper, if not a little odd, video out of it. 'Dirty Diana' is one of the better 'Bad' singles, I think. Probably my second favourite after 'Smooth Criminal'.